Element SNEKSE_BOOKMARKS_OMAHA is undefined in APPLICATION. Do you ever suddenly get a craving for a certain type of food? I do and when I do, the craving is so strong that I can't think of anything else until I get it. So, what's a California girl transplanted to the middle of the country supposed to do when she has a gigantic seafood craving? Answer: Take a drive to Shucks and indulge in the fresh fishy goodness. I've only been there a couple of times since it's a bit out of my way, but I think for a treat, it's well worth the trip. For their special, they offer a list of different oysters on a half shell at a very reasonable price. When we went, they had Clue Points, Chesapeakes, Malpeques, Canada Cups, and Quanset Points. Each ranged from $0.75 to $2.05 and you could order singly or you could get what they call a Roundabout which is 2 of each type of oyster for $13.95. We got the Roundabout and they were delicious. I'm not a huge raw oyster fan if it doesn't have a fancy schmancy mignonette sauce on it, but I tasted one of the Malpeques and it was quite tasty. Small and meaty that was Very clean and crisp with the flavor of the ocean. If raw is not your thing, they have many different fried items like calamari, shrimp, clam strips, oysters, and baby potato cakes - all which can be found as separate appetizers or on a sampler platter. I would like to say that all of it was cooked very well - no rubbery calamari or shrimp here - but the breading was inconsistent each time we went. The first time we went, the breading was thin and crunchy with a slight kick of seasoning. The second time we went, the breading was still thin and crunchy, but it was extremely salty and pretty spicy. Enough to the point where I thought it ruined my fish and chips (they use the same breading) so I pulled it off of my fish pieces. San Fran Cioppino - very flavorful, but not a traditional cioppino with big chunks of fish and shellfish in it; it had small pieces of misc fish. Clam Chowda - very creamy and tasty; would order again. Fresh Fish Chowda - so buttery that it was all you could taste and was like drinking a melted stick of butter; not sure if they didn't stir it before serving or if an extra pound of butter made it into the pot. Halibut O'Boy - they use the same breading as on the fried seafood items, pretty tasty. Jambalaya - had good flavor, but was a dry jambalaya; don't expect the traditional juicy stew poured over rice, this stuff kind of looked like Zatarans. Grilled Salmon - Eh, it was grilled salmon, but it was cooked well. Green Bean Risotto - trust me and take a pass on this. And now my favorites. I really enjoyed the fish and chips made with cod and the seared ahi tuna salad. For me, it's usually pretty hard to mess up fish and chips, but it's also pretty difficult to make fish and chips that make you say 'WOW!' I said wow the first time I went to Shucks the first time and someone had it and the only other time I've had wow quality fish and chips was in Redwood City, CA at the Old Port Lobster Shack. The fish was so juicy and had a light flavor and silky texture that only cod can have. The seared ahi tuna salad was probably the best seared tuna salad that I've had in Omaha. It was a healthy sized tuna steak marinated in what seemed like a sweet soy marinade, seared for probably 30 seconds on each side, sliced and placed on top of salad greens. You get your choice of dressing, but I recommend what the waiter recommended to me - the house Vidalia onion dressing. In the words of the toothy FoodTV personality, Rachael Ray, YUM-O. The tuna was firm and fresh and honestly, there was so much of it, I may even get that salad again the next time I'm craving sushi. That's how good it was. And at $9.95, it's a steal! You can't beat that with a stick. If you're looking for some fresh seafood in the Omaha Metro - go to Shucks! 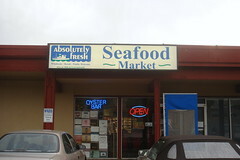 It's a hidden little gem that serves great fish on Styrofoam plates and has excellent prices. 120th & Pacific -or- 168th & W Center Rd. Search Gastronomic Fight Club for restaurant reviews, recipes, food news for Omaha and more. The things we have (or pine for) in our own kitchens. WINNERS: 2014 Best-ter-est of Omaha Restaurant Awards! Gastronomic Fight Club is a widely read food blog with a mission to find the best of the best. Our focus is to provide our readers with unbiased critical reviews of all things food and technology related. Join us for Restaurant reviews, Recipes, Food News for Omaha and more.